Welcome back to Destiny, Ohio where the air is clean, life is apparently uncomplicated and hunky men are thick on the ground. 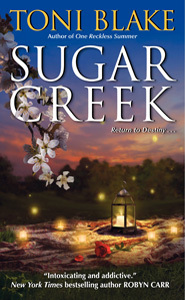 In Toni Blake's new release, Sugar Creek, we meet another alpha male (remember Mick Brody?) with all the attributes of the perfect romance hero. Mike Romo is tall, dark, handsome and in uniform. A cop's uniform, that is. And he's determined to keep Destiny safe. That includes stopping Rachel Farris as she does twenty over the limit just outside of town. Rachel is now a city girl, summoned back to Destiny to help her elderly grandmother harvest the family apple orchard. Sparks fly as Officer Romo hands Rachel a speeding ticket along with a case of unrequited lust. Or so she believes. But Mike is not as unaffected by her sudden reappearance as Rachel thinks. Unfortunately, the Romos and Farrises are Destiny's version of the Hatfields and McCoys. A long ago betrayal by Mike's grandfather Giovanni drove Edna, Rachel's grandmother, to take action - and the apple orchard. Bad blood has been flowing between the families in large cascading rivers for two generations, although Edna has come to depend on Mike, despite his last name. And Mike has a soft spot for Edna. But Rachel believes Mike is only in it for the apples and vows to protect her grandmother and the family business from all things Romo. Rachel and Mike circle each other for days, denying the unwanted attraction until they are thrown together in a small concession booth during a town event. Surprisingly, they work well together, serving snacks to the good folks of Destiny, but the real spirit of cooperation begins after the event is over. I'm not sure where Ms. Blake derives her inspiration, but a couple of hallelujahs are certainly in order. But both Rachel and Mike have issues beyond the infamous family feud which threaten to derail their tenuous relationship almost before it begins. Rachel returned to Destiny reluctantly and only temporarily - she has a high powered job in Chicago and a life purposely different from her small town upbringing. Mike is still dealing with a horrific family tragedy that shapes every feeling he has and every decision he makes. And as if this colorful tapestry wasn't enough, Ms. Blake adds even more by weaving Edna and Giovanni's story in, out and between Rachel and Mike's. Ms. Blake is a master at slowly drawing her protagonists, allowing the reader to feel each character's struggle to accept a particular truth. She did this brilliantly in One Reckless Summer, the first in the Destiny series, and succeeds again in Sugar Creek. There is a lot going on in this book and while less emotionally wrenching than its predecessor, it is more complex. 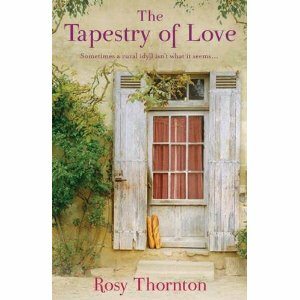 It took more effort to get to the heart of the matter but once I was there, I was enthralled, swept away and completely won over. Sugar Creek gets an enthusiastic two thumbs up. It's exactly what I've come to expect from Ms. Blake - and a certain must have for your romance library.